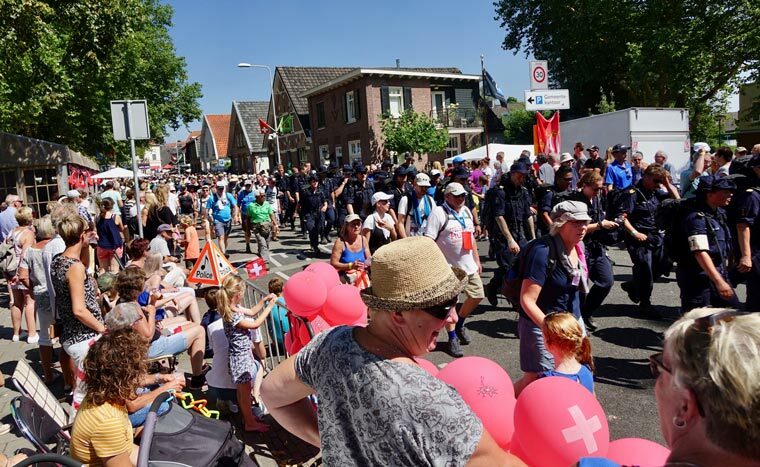 There are many reasons why 250 men and women of the Swiss Armed Forces continue to participate at the 4 Day March in Nijmegen, Holland, every summer. The even attracts 5,500 military personnel and 40,000 civilians from 100 countries. 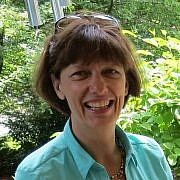 Dutch people love the event! Extended families camp and picknick along the route. Children play, stand in line for high fives and everyone cheers on the marchers, offering water and fruit. The supportive atmosphere is infectious and soon I stand at the corner and clap and cheer with everyone else. 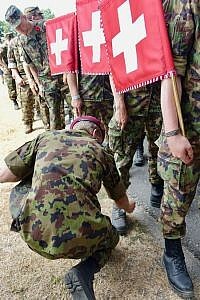 The Swiss marching groups, identified by their flag bearers, are warmly welcomed everywhere. The Netherland Government builds a special camp in a nature reserve, It also provides the infrastructure to house and feed the Armed Forces marching groups of 29 countries. Many shared events take place during ceremonies in the military camp, and also arise spontaneously. Participants encounter commemorative World War II sites every day on their march. In fact, Operation Market Garden played out in this region. 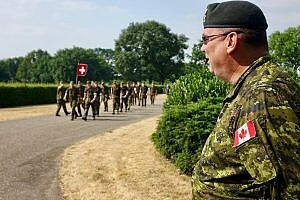 Groesbeek Canadian War Cemetery with 2,100 Canadian and 267 unidentified soldiers is located en route. This is the 60th year the Swiss Armed Forces halt here to honour the fallen WWII soldiers. The soldiers polish their dusty boots. Solemnity is shining on their faces as they regroup after a short break. They listen attentively to their commandant’s instructions how the ceremony is to unfold. Canadian Generals and Swiss Brigadier-Generals are present as the Cantonal Police Band of Berne starts to play a fitting chorale. 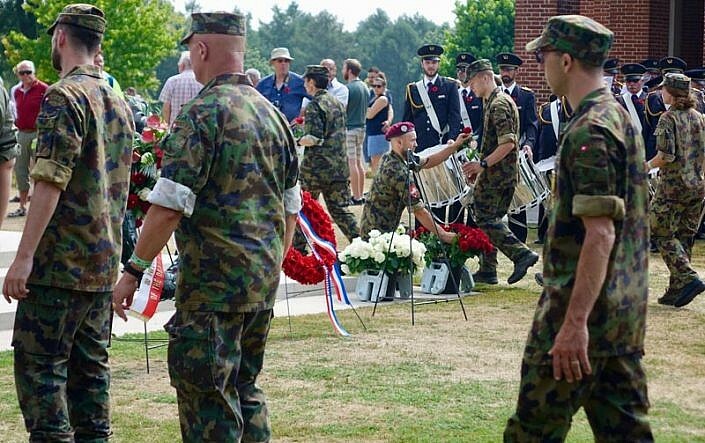 Every man and women of the Swiss Armed Forces plants a long-stemmed rose into the soil of one of the soldier’s graves, then spends a moment of silence. A hush has fallen over the assembled and in many an eye a tear is gleaming. Colonel Gwerder point to photos from forty years ago that show the cemetery bare of flowers. Today, the graves are framed by fragrant rose bushes! 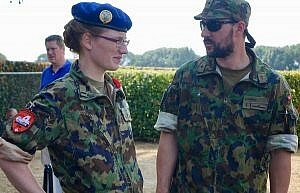 Per chance, I met a young Swiss female soldier who is a dual citizen Switzerland/Canada. She is very proud to be part of this march and ceremony and introduced herself to the Canadian General present. At the time of this writing, it confirmed that Major Gustave Daniel Alfred Bieler – a Swiss national who immigrated to Canada before WWII – served in the Canadian Armed Forces on the Allied side during operation Market Garden. Through the exchange between the Canadian and Swiss Commandants at this year’s march, Major Bieler was identified as having been buried at Groesbeek Cemetery. 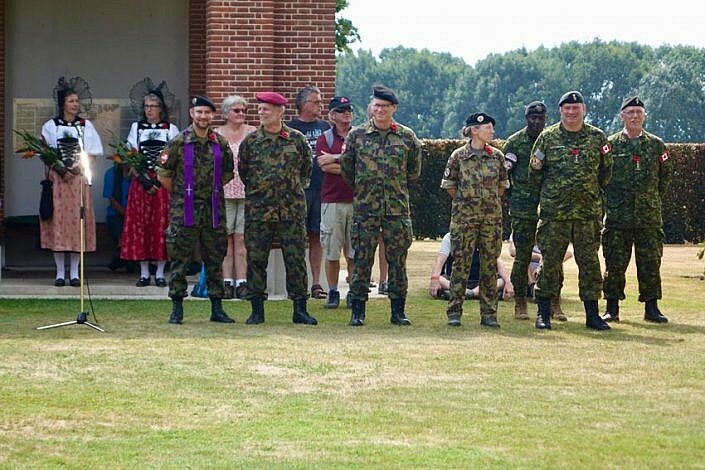 The fallen Canadian Major turns out to be a direct relative of the Swiss Chaplain who held the commemorative speech at this year’s Groesbeek ceremony! Well organized & supported by the Dutch people and local & federal governments, the 4 Day March is an upbeat and impressive athletic event. It brings together civilians and military participants from all ranks and walks of life, and from all corners of the world. 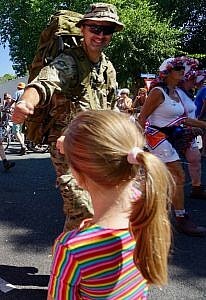 A challenging endeavour for every marcher, it blossoms in the cross-national individual, army and community support. It must surely be one of the most unique, if not most successful joint military, civilian and government events around the globe! 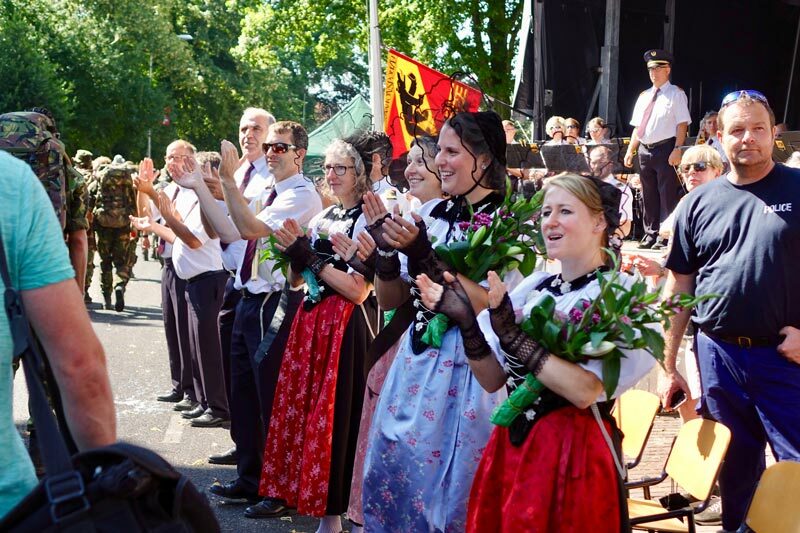 The 103rd 4 Day March will take place from July 16-19, 2019. 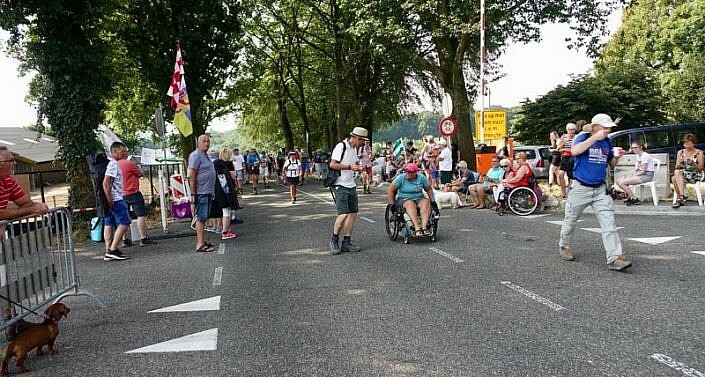 Have you watched or even marched in one of the 4 Day Marches in Nijmegen? We would love to hear from you! Please leave a comment below! Thank you.